Gori Tere Pyaar Mein, directed by Punit Malhotra, is a love story of complete opposites. Sriram Venkat (Imran Khan) is a laid-back, young architect who doesn’t value relationships. He is often referred to as a misfit in his family. Dia (Kareena Kapoor) is his complete opposite. She is focused on her career and is born to make a difference to the society. Like most romantic relationships these days, they fall in love, break-up and then fall in love again. The first half is bang on in terms of novelty and introduction of the characters. It revolves around a Urban city, with a carefree Imran who doesn’t value his relationships or commitments, but slowly begins to realise his love for Kareena. Till interval, the story is extremely predictable. However, what saves the film is Malhotra’s treatment. In the second half, the director takes you into a different world altogether. From a familiar urban setting to a small village in Gujarat filled with innocence and old-world charm. Just as the pace begins to slacken, Anupam Kher makes an appearance as the collector of the Jhumi village and entertains with his brilliance. The break up scene is very well executed. Imran’s final confrontation with Anupam Kher. The sardar singing ‘Bulla Ki Jaani’ at Shraddha’s wedding is hilarious! Scenes between Imran and Kareena’s father. Imran running away from his wedding. The music is catchy, but slows down the pace in the second half. Imran does well in ‘Dhat Teri Ki’ and dances like never before in ‘Chingam Chabake’. The camera work is first-rate. Background music could have been better. Imran was criticised for his weak performance in ‘Once Upon a Time in Mumbai Dobara’, however the actor impresses big time as Sriram. He keeps it simple, knows his limitations and delivers what could well be his most spontaneous performance. His interactions with Dia’s father and Anupam Kher are hilarious. Kareena Kapoor Khan adds life to Dia. Her performance in Gori Tere Pyaar Mein will be a treat for her fans. Like always, she looks stunning! Watch out for her sequences in the village standing up against Anupam Kher. Shraddha Kapoor gets a decent amount of screen time for a cameo. Her character is very likeable. Anupam Kher is brilliant in a role with grey shades. Esha Gupta has one song, Dhat Teri Ki. 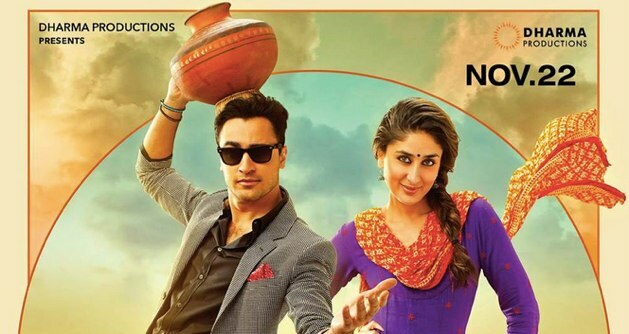 To sum things up, Gori Tere Pyaar Mein is a film that can be watched and enjoyed with family or friends. If you like a feel good love story, like most of us do, go give it a try! Singh Saab The Great Review: A film for Sunny Deol fans! Hmmm… Good. Gonna watch it next week. Much better than Krrish 3. Imraan acted much better than Hrithik in Krrish 3. But other critics gave it low ratings! !indicine gave bmb and ranjhaana also 3.5. .so this is that much good? ? Good work by both the actors and director. Enjoy the movie، had a good tym…. Gtpm is made for romance. Is that a review ? Did they pay money to publish this. The review should not be always in favor. It should be to the point. Not like this bro, get a life !!! just watched it ! a must watch for rom com lovers. Gori tere pyaar mein is an awesome movie, loved it. People are creating negativity about the movie without even seeing it. Gori tere pyaar mein is an awesome movie and everybody should give it a try.